Picture #1: Conference room corner window unit showed signs of mold and moisture damage behind vinyl wall coverings (vinyl wall coverings are loose and not bonded to sheetrock around window box). 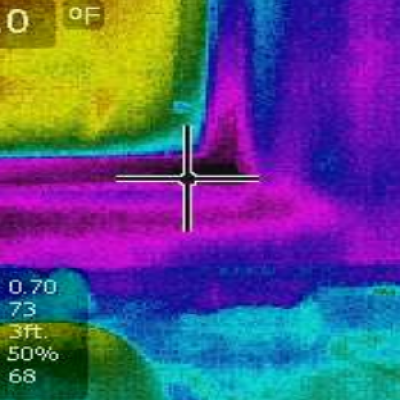 Water stains are evident at top right and left hand sides of window mulls suggesting moisture is emanating from above window unit and making its way down to the wall below. 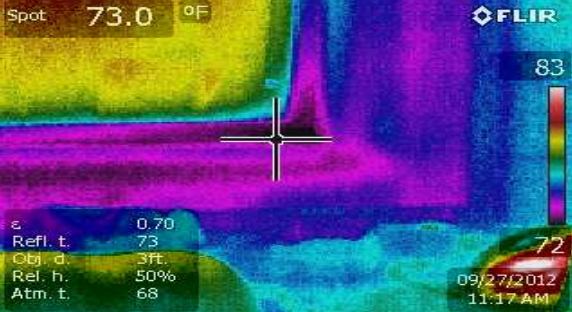 Moisture readings in the sheetrock sill area and head of window read 0%. Attached inferred scan indicates cooler areas above the ceiling line and interior corners indicated by the dark blue and purple shading. Picture # 2: Inferred comparison. 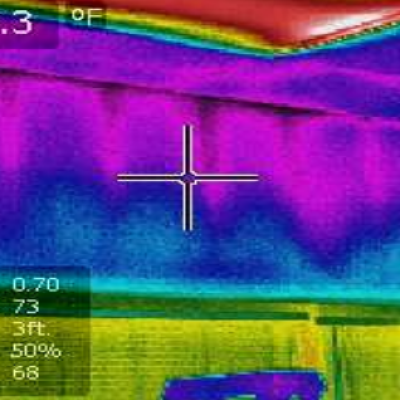 Picture #4: Southeast office; moisture readings were taken from sheetrock sill of corner window unit, a 50% percent moisture reading was present at mid and end sections of the sheetrock window sill. 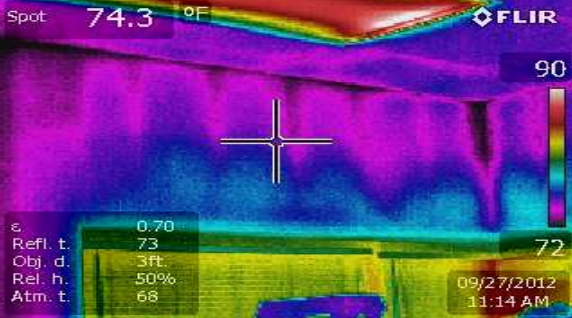 Inferred photo indicates moisture and probable mold behind solid vinyl wall coverings. Picture #5: Exterior: Hard water stains were present on the South, Southeast, and East windows indicating windows are being sprayed by irrigation heads located below the window units. Irrigation system was cycled to test their spray pattern, four of the raised sprinkler heads were spraying the side of the building and windowsills. (Note: there’s a ten-foot overhang protecting these windows from rain and storm elements.) 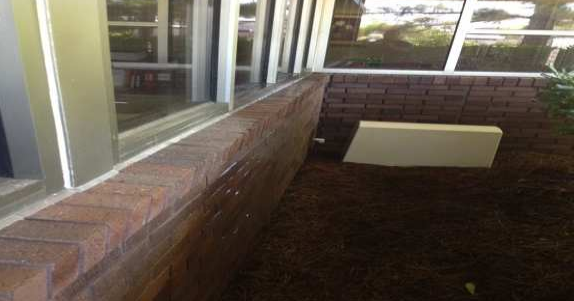 Conference room window vertical expansion joint to right of window is separated at multiple areas allowing moisture to enter behind brick veneer and lentil above conference window. 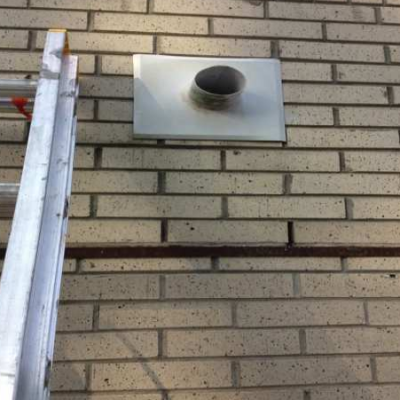 Picture #6: A determination cannot be made regarding the copper flashing at base of roof parapet. When probing with a blunt screwdriver through weep holes above the copper flashing the backside of the flashing was undetectable. If building plans are available we will need to verify this detail. Four-inch PVC roof scupper above right side of conference room window drains over the failing expansion joint, copper flashing at parapet wall and lentil above the conference room window. 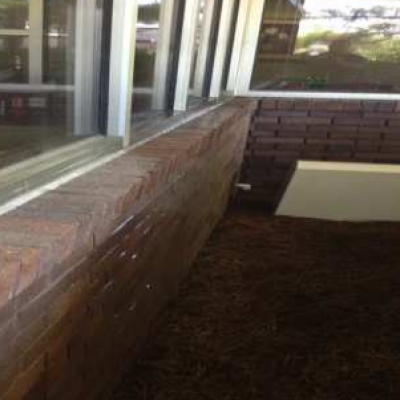 The lintel above conference room window slopes towards the outside corner of the building leading us to believe this is one of the contributing factors to the leak identified at window mulls. Picture #7: Inspection of the aluminum window pans at the South, Southeast offices, and conference room revealed there is no pan assembly implemented with turned up ears on the right or left-hand sides of these window units. Roof: PVC roof membrane appeared to be in like new condition, parapet section over conference room had no tears or loose laps evident that could be contributing to the leak above the conference room window and wall. Inconsequential amounts of pine straw and tree organics were collected around the roof drains. Debris was removed from around the roof drains during our inspection. Windows above platinum and upstairs office had two water stains on the topside of the tray ceiling over the open workstation. We determined these leaks were coming from unsealed laps in the aluminum window pans. 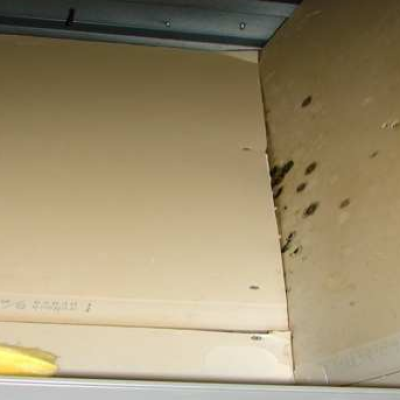 Conclusions: Based on the observations described in above report it is our opinion that the issues identified on this property exist and are the cause to the water damage and mold you are experiencing. 1: An industrial hygienist needs to test the affected areas outlining their findings and provide a protocol. 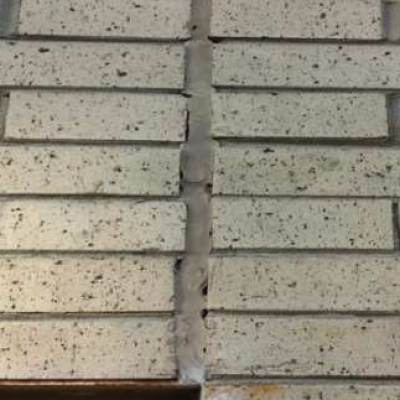 2: If test results turn out positive a mold remediation contractor will need to be brought in to remediate the mold following the outlined protocol provided by industrial hygienist. 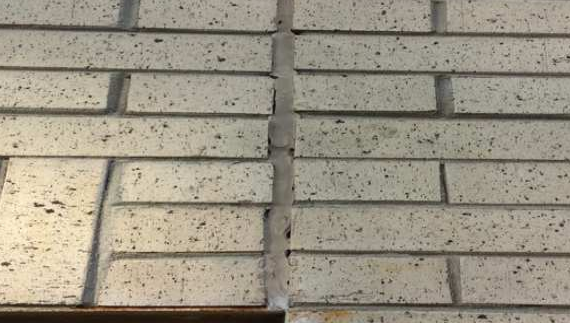 3: Inspect and replace failing caulk joints, it may be a good time to replace all caulk joints that have direct sunlight exposure with limited or no overhang protection. 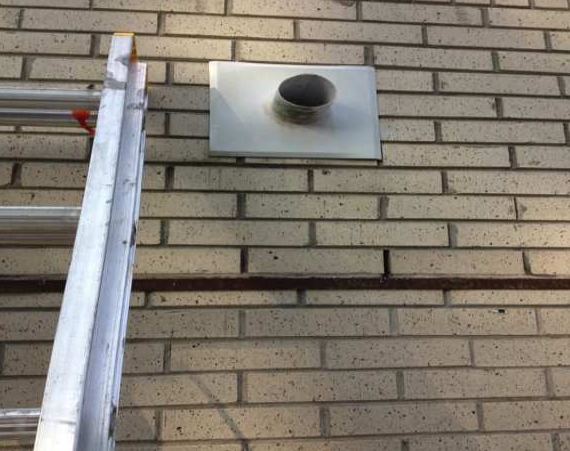 4: Roof scuppers needs to be redirected away from side of building or piped to the ground. 5: Redirect irrigation away from building or implement a drip system. 6: Window pans need to be end sealed. 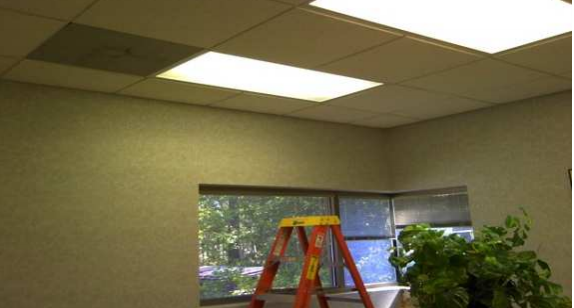 7: Insulation needs to be repaired and replaced where missing in suspended ceiling. 8: HVAC system needs to be thoroughly looked over and balanced. 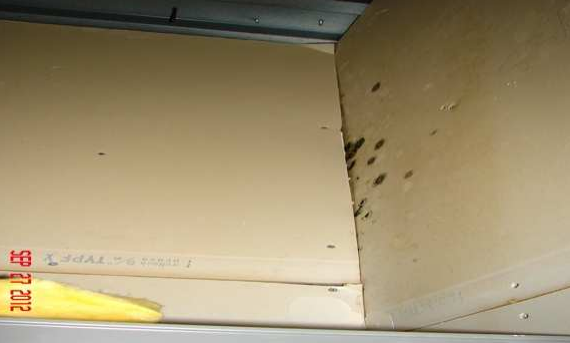 This may be in part why we are seeing condensation stains on transom windowsills and ceiling tiles. 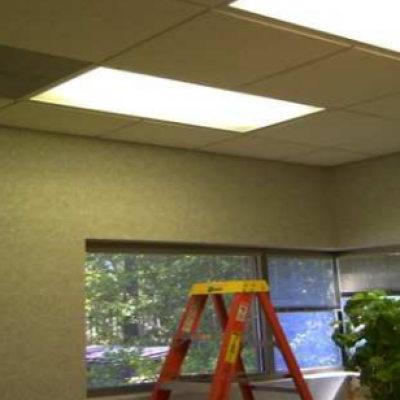 9: Remove all solid vinyl wall coverings from exterior walls. Recommendations: Based on defects observed, a comprehensive repair scope to correct the observed deficiencies is recommended and can be provided after industrial hygienist report and protocol is rendered.